English artist Chris Tampin initially established his czee13 alias with original, urban-stylized sticker designs before becoming known for his street art murals. But, around the same time this evolution was taking place, Tampin’s already existing interest in the designer toy movement led him to experiment with sculptural forms. Beginning in July of 2014 with three cut and assemble paper forms, titled Addict Bunny, Hog Hunter, and Life Bunny, Tampin would begin sculpting and casting pieces in resin early the following year. Having created the foundation of what would become his czeetoyz brand, which he uses synonymously with his czee13 identity, Tampin’s output in this direction has been a runaway train of inventive creations ever since. And for his recent solo exhibition, Creative Solitude at the Clutter Gallery, it is a collection of new works that also serves as a retrospective, the pieces touching upon and reinvestigating various points throughout his career. Representative of where Tampin’s creatively journeyed too, specifically his recent anthropomorphic baked goods pieces, a pair of Choc Chip Happy Dappy Cappy Cookie works adorn the window display, each exuding joy from their expressive facial features and attired in their branded snapback hats. And, serving as a reminder of where he’s been, the artist has positioned a hand-modified rendition of Buff Monster‘s eponymous, bubble-like form, rusted weathering scorching its exterior as an oozing guiser holds it aloft, this latter aspect coming from Tampin’s own mid-2015 released Crackpot resin creation. But this entire topmost display shelf is mainly dominated by Reach for the Stars, a uniquely hand-painted rendition of Kidrobot‘s Mega Munny form. Nestled next to it is a partially obscurred rendition of the artist’s own paintbrush-wielding Toy Soldier creation, a purportedly cartoonish self-portrait. And flanking this center area are a trio of space-themed To the Moon pieces, these cat-like Trikky designs augmented with domed windows that reveal skull interiors. And while these To the Moon works are reminiscent of Tampin’s contribution to last year’s They Came from Planet Rainbow Sparkles exhibition, these have a darker base coat of paint and are embellished with the artist’s so-called “canbot love” design, a full moon shape illuminating the profile of two spray can topped robots as they hold hands. And this last mentioned element perfectly preludes the shelf’s final piece, the newest evolution of his popular Follow your art from 2016, a concept which incorporates spray can tops into Kidrobot’s Munny forms. Residing upon a hand-decorated stone base, itself eluding to the meditative and reflective nature of Creative Solitude, Tampin reveals a selection of his fairly recent Grafkitti creations, each of these hand-painted “graffiti cat” works adorned with the artist’s “canbot love” design upon their left foot. Featuring further iterations of his Cookie sculptural design, including the Burnt Cookie renditions with their flame-adorned snapbacks, the chocolatey brown of these perfectly contrasts against the lightness of the Pinky and Jammy editions, their decoratively designed bodies housing heart-shaped mouth openings and joyful tears of jam running down their wafer-like appearances. And balancing upon a paint-splattered stone, two more Rusty Empty pieces complete the composure of the exhibition’s window display. As a born and raised citizen of the United Kingdom, Tampin is almost certainly influenced by the country’s massive use of electronic surveillance, specifically the plethora of CCTV cameras that now intrude into their lives. 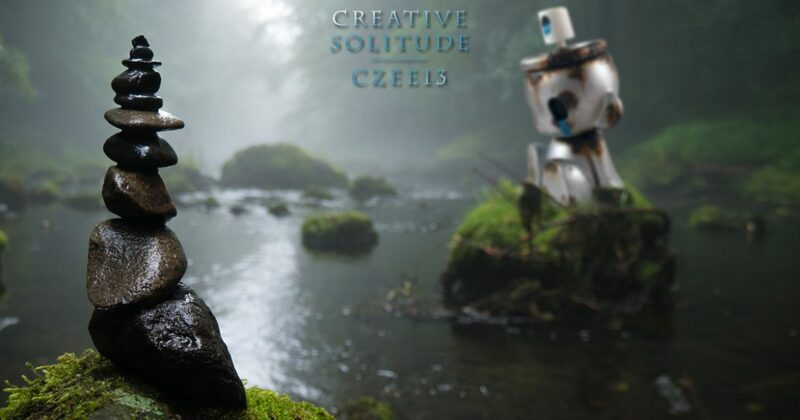 Having previously tackled this technology artistically with his Lunartik Space Cruiser Czeetv piece near the end of 2016, Tampin revisits it for the solo exhibition with a trio of CZTV Custom CCTV Camera works, each one helmed by a canbot sculptural form. Creating a context regarding the potentially unlawful acts of street artists with the devices that can be used to catch them, this is the antithesis of “creative solitude”, a reminder that some artists are never truly alone within the UK. Completing the sculptural contributions to the show, Tampin has situated five Street Series Empty Can Scene works underneath the CZTV Custom CCTV Camera pieces. Based on his Empty form from 2017, an evolution of the Munny shape into a sitting position with excised eye holes and a spray can head topper, these are situated within dioramic bases that have been seemingly paint-splattered by the figure that resides upon them. Each featuring paint drip tears streaming down their forms, this overt sadness relaying their feelings about having been used up completely, this concept is accentuated by the eerie glow emiting from their eyes by inset lighting mechanisms. And perhaps these convey the true statement behind this exhibition, to the loneliness an artist might feel when trapped within their Creative Solitude. Having had its opening reception on Saturday, June 9th from 6-9pm, all works in this exhibition will remain on display until July 6th, 2018 at the gallery’s physical location (163 Main Street, Beacon, NY 12508).